Upcoming Outset Series Shows at Revival Drum Shop (1465 NE Prescott). All shows start at 8 and end by 10. $5-15 sliding scale. July 18-21: The 33rd Annual Cathedral Park Jazz Festival. Lots of awesome at this festival including Blue Cranes, Thollem McDonas, Tim DuRoche and many more. Go to there. Cramped into one corner of Seeds, a single-room arts space in the quickly gentrifying Prospect Heights section of Brooklyn, on a recent June evening were the five musicians of Black Host: at his drum kit, Gerald Cleaver; hunched over a small synthesizer, Cooper-Moore; backed up against one wall, bassist Pascal Niggenkemper; over to one side, guitarist Brandon Seabrook; and up front, alto saxophonist Darius Jones. The room was otherwise jammed with some two-dozen listeners sitting on folding chairs (including a trumpeter of note and a well-connected concert producer). If this felt like a happening scene, it was. If it looked a bit like someone’s home, it is. Saxophonist and arranger Ohad Talmor lives here. When the band emerged from behind a red curtain, we got a peek into Talmor’s kitchen. Seeds is a low-key, suggested-donation place, and it’s been host to some worthy and inventive music. 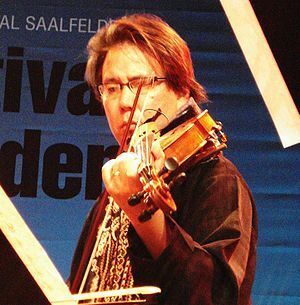 Mr. Kang, a global citizen based in Seattle, is principally known as a violist and violinist and is widely recognized for his work with a diverse range artists and bandleaders — Laurie Anderson, Bill Frisell, Beth Orton, Mr. Zorn, Beck. Between such engagements, he has fashioned a body of work that finds common ground in improvisation, European early music, Eastern devotional styles, black metal and more. Some of his music can be abstruse at first brush; much of it is otherworldly and ravishing, especially when the vocalist Jessika Kenney, Mr. Kang’s wife, is involved.